80 deliveries (including 2 second hand aircraft). Orders: 113 firm plus 40 options (112 of the orders for its ATR-72). With this post I just wanted to log the latest data and update the graphic in which I compare ATR yearly deliveries profile with World GPD growth and most importantly oil price. ATR deliveries vs. GDP growth and oil price (2017 update). It is interesting to note the drop of the oil price from around 90$ to below 50$ since 2015. 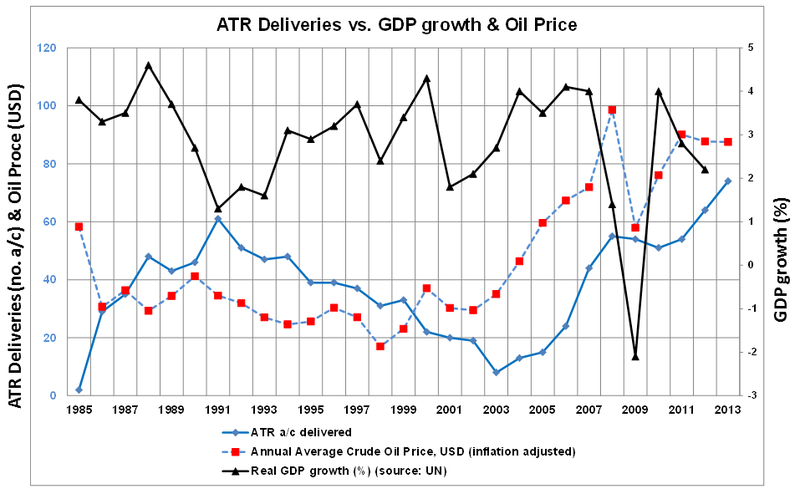 ATR deliveries correlated well with oil price with a lag of a few years time. The correlation up to date continues to be quite high. So far, through 2017 aircraft production has kept up around 80 deliveries a year. In 2017, the book-to-bill was 1.45 (with the above-mentioned 113 firm orders), so ATR should be able to cope with high production for another couple of years. We will see later on whether the oil price raises again, whether the correlation deliveries/oil price holds or breaks, and whether ATR manages to keep up production in response to the market. Revenues increased 10% to 1.8bn$. A new record of 83 deliveries (+12%). A record backlog at year-end with 280 firm aircraft in the order book. When calculating correlation between the different variables, I discovered that the correlation between GDP and deliveries is rather low, despite of the time lag applied (be it 2, 3, 4 years…). However I found that the oil prices and deliveries did correlate very well with a lag of 5-6 years, yielding coefficients of 0.55-.65, which are rather high. I wanted to update the calculations I made then and last year, with the information of the 2014 exercise. 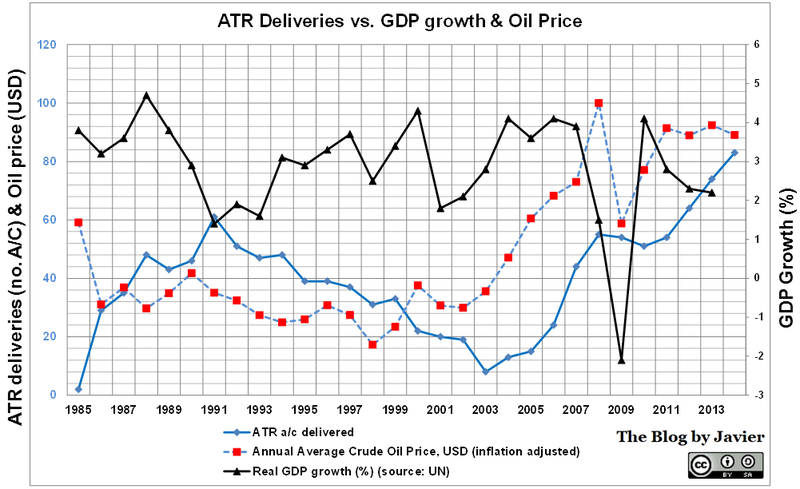 ATR deliveries vs. GDP growth and oil price (2014 update). Between oil prices and deliveries: high, above 0.54 from 1 year time lag, increasing through 6 years time lag (when it reaches a maximum of 0.82). Between GDP growth and deliveries: low, not more than 0.34, and negative correlations up from 1 to 5 years time lag. Oil prices drop Q4 2014. However, this large drop is not yet fully noticed in the comparison made before as the historical database I use (here) only reflects prices up to the end of November and thus the 2014 average is still 89$ vs. 92.4$ in 2013. Even so, taking into account the figures from December (~55$) the year average will drop only to about 86$, not changing much the result. 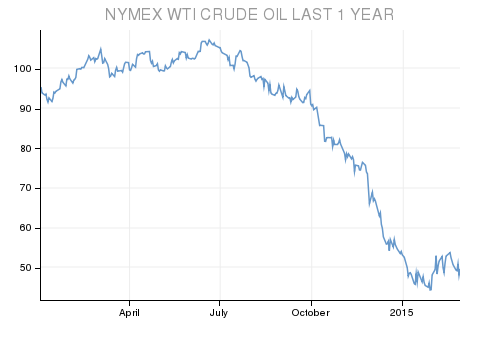 It would be interesting though to see if oil prices stay low (50-60$) for the full 2015 year. If so, we could check whether the correlation stands and ATR starts to notice it in the form of lower orders (more cancellations?) and this is translated into lower amount of deliveries in about 3 years time (2018?). (1) Some 18 cancellations that took place in 2014 go untold in the press release, though they are easily deduced from the information of orders, and backlog from 2014 and 2013. (2) About 3 of those 6 years are consumed from placing the firm order to getting the aircraft delivered, as we can see by the current figures of backlog (280 a/c) and yearly deliveries (83 a/c). 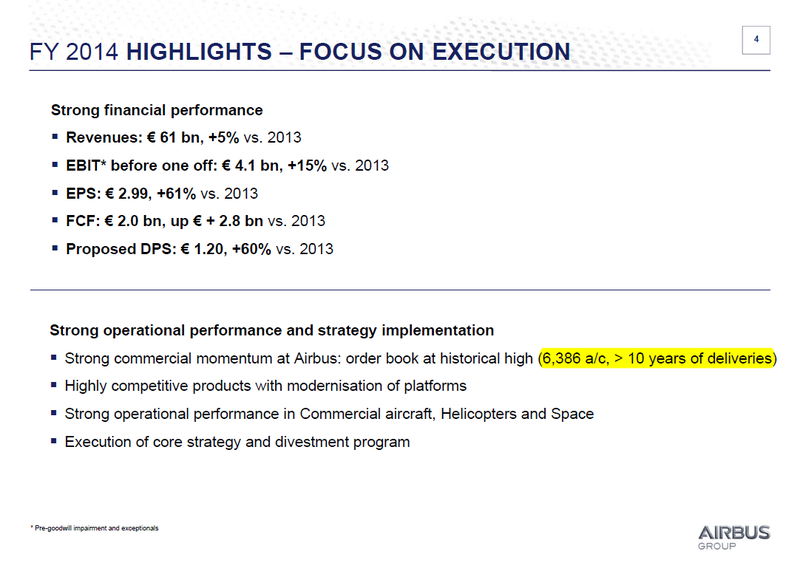 AIRBUS 2014 results – backlog. Airbus has a record backlog of 6,386 civil aircraft. In 2014, Airbus delivered 629 commercial aircraft. That is why, in the presentation it is stated “> 10 years of deliveries”. In essence, one may see it as if Airbus airplanes were sold out for the next 10 years! Of course, that is not the case for all product lines (think A330, A380) and will not be the case as a production ramp-up is announced in the A320ceo line. Nevertheless, to put it into perspective, I wanted to compare this backlog to the historical aircraft deliveries of Airbus (which can be found here). Since its first delivery, an A300B2 back in May 1974, through the end of January 2015, Airbus had delivered 8,921 aircraft. With the information of yearly deliveries I compiled the graphic below, yearly per model and cumulative deliveries for all models combined. AIRBUS deliveries through January 2015. Take a look at the cumulative deliveries. On the occasion of the 8,000th delivery, on August 2013 (an A320 for AirAsia) Airbus published an article making a review of all the main delivery landmarks. the 1st delivery, in May 1974, an A300B2. the 9,000th delivery… somewhere in the Spring 2015. 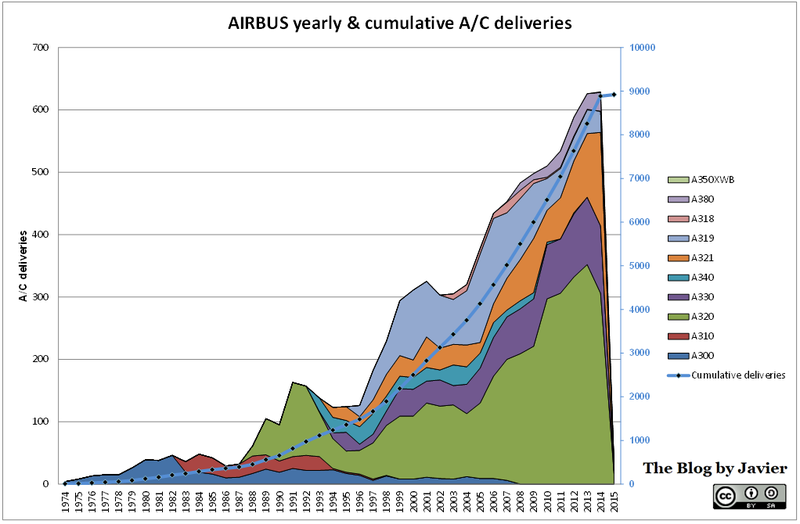 You can see that since the first delivery in 1974, it took Airbus almost 19 years to deliver the first 1,000 aircraft. In the previous years I have been estimating the discounts Boeing applies to its list prices of commercial aircraft. You can see here the result of last year estimate (based on 2013 figures). The results I arrived at are that Boeing has been increasing its discounts in the recent years, and that in 2013 they topped ~47%. 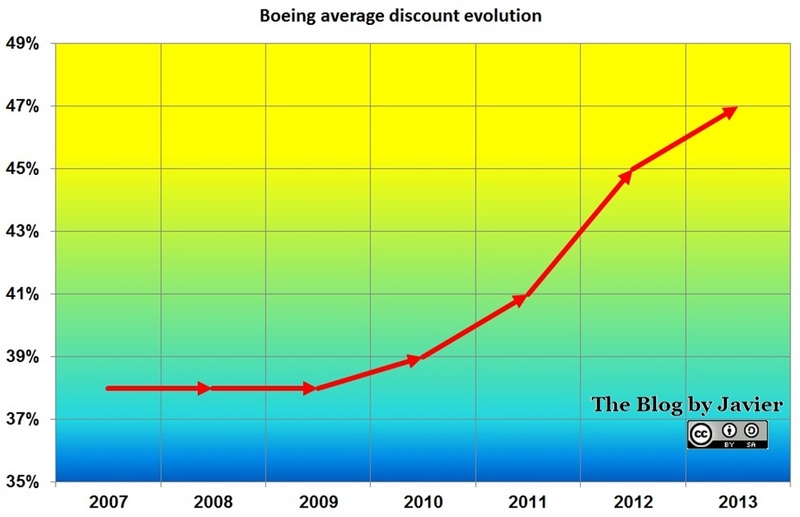 Boeing Average Discount Evolution, 2013. With this post I wanted to take a step ahead and put the model to the test by using it for forecasting what will be Boeing Commercial Airplanes revenues for the year 2014. As of today, January 15th, these have not been announced yet. In Boeing’s investor relations website you can see that the 2014 earnings conference call will take place on January 28th. How will I reach to my forecast? See here Boeing (net) orders for the year 2014: 1,432 aircraft among all models. See here Boeing deliveries in the year 2014: 723 aircraft among all models. See here Boeing 2014 list prices. See in the above curve the average discount I will use: 47% (unchanged from past year, this is a hypothesis that will be put to test with how accurate the forecast turns out). See here [PDF, 841KB] Q3 2014 earnings press release. I use it to see how were faring in 2014 Boeing Commercial Airplanes services, deducing it from the reported Sales of Services, Boeing Capital and Global Services & Support. Up to end September 2014, the services figures were declining in comparison to 2013 figures. I will assume the global figure to follow the same proportional decline; arriving at ~589m$ for Boeing Commercial Airplanes services (remember, this figure will not be actually explicitly reported). With all these ingredients… my forecast is: 60.2bn$ (1). Boeing’s 2014 Financial Outlook at Q3 2014 earnings press release. First, you can see that my forecast (60.2bn$) is a bit more optimistic than Boeing’s own outlook 3 months ago, 57.5-59.5bn$ (2). Second, in the 2014 Q3 release, you can see the revenues up to end September (below). In them, you can see that up to then, revenues of Boeing Commercial Airplanes had increased 13% in relation to 2013 (12.66% to be more precise). My forecast is a bit more optimistic here as well: at year end the increase in revenues will be +13.6%. Boeing Commercial Airplanes revenues Q3 2014. Final comment: if Boeing managed in 2014 to command better prices on delivered aircraft, the figure will be even higher. If the figure is lower than the 60.2, and in line with their forecast, it’ll mean that the market is forcing Boeing to apply ever higher discounts to their published list prices. I am now looking forward to January 28th and Boeing’s earnings call! As announced, Boeing published on January 28th its full 2014 results [PDF, 838KB]. Which were the Boeing Commercial Airplanes revenues? Boeing Commercial Airplanes revenues full 2014. That is 59.99bn$, or 206m$ short of my detailed forecast of 60.196bn$. This means that I missed with my forecast by a 0.3%, not bad. Even better taking into account that the main discrepancy have been the lower level of services under the commercial airplanes unit. The result, as my intuition went was above the upper limit of the bracket Boeing gave as guidance for the full year in the 2014 Q3 report, 57.5-59.5bn$ (see note (2)). (1) To be more precise the forecast from the model is 60,196m$. (2) If my forecast turns out correct some may be tempted to say that this is the usual trick played by CFOs: to present better figures than expected. Revenues increased 13% to 1.63bn$. A new record of 74 deliveries (+16%). Backlog at year-end of 221 firm aircraft orders. I wanted to update the calculations I made then with the information of the last years. ATR deliveries vs. GDP growth and oil price (2013 update). Between oil prices and deliveries: high, above 0.54 from 1 year time lag, increasing through 6 years time lag (when it reaches a maximum of 0.77). Between GDP growth and deliveries: low, not more than 0.26, and negative correlations up from 1 to 4 years time lag. (1) 15 cancellations (4 ATR-42 & 11 ATR-72) that took place in 2013 go untold in the press release, though they are easily deduced comparing orders and backlogs for 2013 and 2012. (2) About 3 of those 6 years are consumed from placing the firm order to getting the aircraft delivered, as we can see by the current figures of backlog (221 a/c) and yearly deliveries (74 a/c).